Every day we use enough single use plastic straws to circle the equator 2.5 times if they were laid end to end. They are not biodegradable and are polluting our environment. 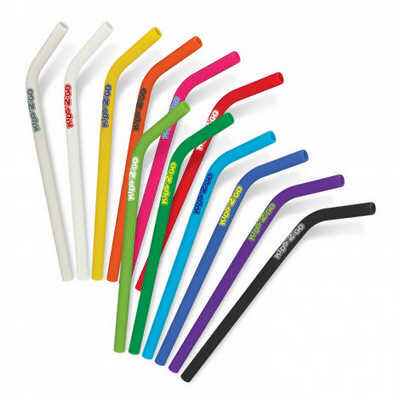 Reusable, food grade silicone drinking straws are a safe alternative and a hot new product for promotion that sends a positive message. They can easily be cut to size with scissors to suit most tumblers and washing instructions are included in each box. Colours: Clear, White, Yellow, Orange, Pink, Red, Bright Green, Kelly Green, Light Blue, Dark Blue, Purple, Black. Dimension: Dia 10mm x H 240mm. Print Description: 10mm x 45mm (one colour). Print Type: Screen Print. Packing: 100 per inner box. Price includes : 1 Col 1 Pos Print. Setup is included.